Purpose Neoadjuvant chemotherapy may modify the yield of involved axillary lymph nodes. The purpose of this study was to identify the clinical significance of the involved nodal ratios in patients with stage II/III breast cancer treated with neoadjuvant chemotherapy. 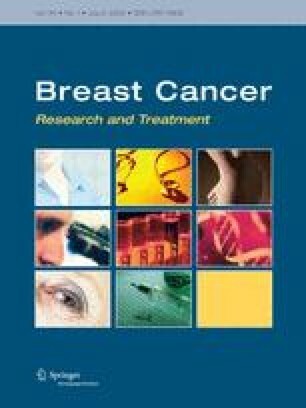 Methods Two hundred and five stage II and III breast cancer patients who received neoadjuvant docetaxel/doxorubicin chemotherapy were enrolled in this prospective study. The patients received three cycles of neoadjuvant chemotherapy followed by curative surgery, either breast-conserving surgery or mastectomy with axillary lymph node dissection, and received three additional cycles of docetaxel/doxorubicin chemotherapy as adjuvant. Adjuvant radiotherapy and hormonal therapy were given after adjuvant chemotherapy when indicated. Results The median follow-up duration was 28.9 months. The overall response rate (RR) for neoadjuvant chemotherapy was 77.6%. The mean nodal ratio was 0.29 (range, 0–1.0; nodal ratio ≤0.25, 121 [59.0%] vs. >0.25, 84 [41.0%]). Relapse free survival (RFS) of the patients who had a nodal ratio >0.25 was significantly shorter (Hazard Ratio (HR) = 2.701, P = 0.001). A nodal ratio >0.25 was also associated with a shorter overall survival (OS) (HR = 4.109, P = 0.006). However, RFS and OS were not different according to the absolute number of involved nodes (ANIN) (P = 0.166, P = 0.248, respectively). In multivariate analysis, the nodal ratio was an independent prognostic factor for RFS and OS (HR = 4.246, P < 0.001; HR = 7.764, P < 0.001). Conclusion Axillary nodal ratios have an independent prognostic value in stage II/III breast cancer treated with neoadjuvant chemotherapy. Nodal ratio might be a useful tool to identify the patients at high risk of relapse in the neoadjuvant setting. This study was supported by a Korean Research Foundation Grant funded by the Korean Government (MOEHRD, Basic Research Promotion Fund) (KRF-2006-531-E00034), a grant from the Seoul National University Hospital Research Fund (05-800-20050148). We would like to thank our clinical research nurse Kyung-Hee Lee for her assistance of clinical trial. We also thank Dr. Cunningham, English editor of BioMed Proofreading for his assistance. This study was presented in part at the 44th Annual Meeting of the American Society of Clinical Oncology, Chicago, IL, May 30th–June 3rd, 2008.